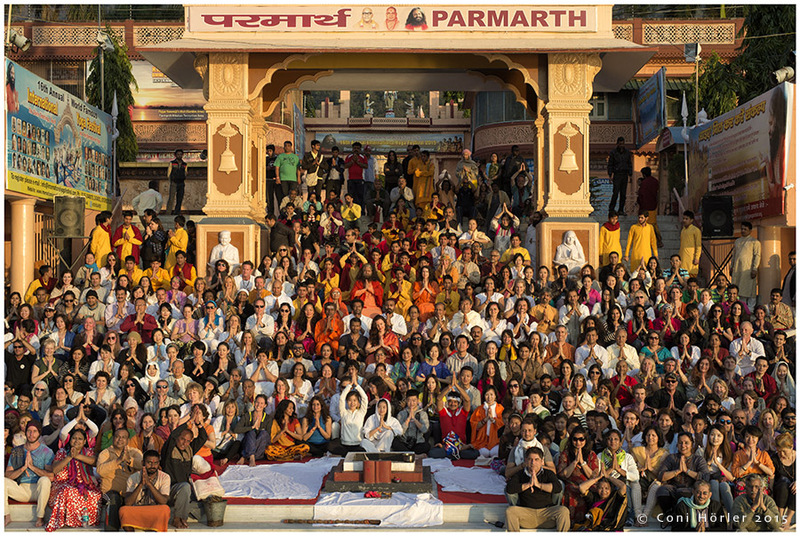 On Saturday 7th March, the 16th International Yoga Festival at Parmath Niketan Ashram in Rishikesh came to a close. It was a truly magical and successful 7-day event with nearly 1000 participants from 60 different countries. They all came to experience yoga in its many forms, taught by expert teachers, respected Swamis and various presenters of different holistic backgrounds. Yoga.in was at the festival to give you some insight on the event! The first day of the festival kicked off with a medley of different yoga teachers presenting their various styles in a packed yoga tent by the river Ganges. Anand Mehrota led with a powerful presentation of Kriya, Asana and Meditation aimed at awakening the Shiva nature within. Iyengar teacher H S Arun soon followed, teaching standing poses, emphasizing the importance of alignment and precision as foundations to the experience of stillness in body and mind. The showcase concluded with famous Kundalini teacher Gurmukh Kaur Khalsa raising the energy of all who participated with a dynamic kriya and meditation. Participants were then treated to an inauguration ceremony with a remarkable yoga demonstration by the Rishikumars, a group of disadvantaged boys who had been taken in by Parmath Niketan and transformed into educated yogis. This was followed by speeches from Prem Baba, Mooji and Shankaracharya Swami Divyanand Teerthji, all emphasizing the power of yoga to remove the barriers of separation, creating union and peace inside and out. It was a perfect beginning to the festival, setting the tone for a week full of joy, fun and togetherness. Kundalini Meditations by Gurmukh Kaur Khalsa on abundance and the joy of togetherness. of several 1-hour activities, including the whirling Rumi Love Meditation, lessons on Vedic Chanting, How to Free the Voice, Sanskrit Alphabet in Sound, Astrology and Past Life Regression Therapy and Reiki. Afternoon yoga was then available including classes including Lila yoga, Prana Dance Flow, Indea Yoga and Shinto Yoga. The wisdom of revered saints was delivered in a series of Special Divine Satsang by the side of Mother Ganga. Every evening the Ganga Aarti (Lighting Ceremony in worship of Mother Ganga) took place with the powerful chanting of Pujya Swami Chidanand Saraswatiji, President of Parmarth and Founder of the IYF, and Sadhvi Abha Saraswati and concluded with a dance and performance program. 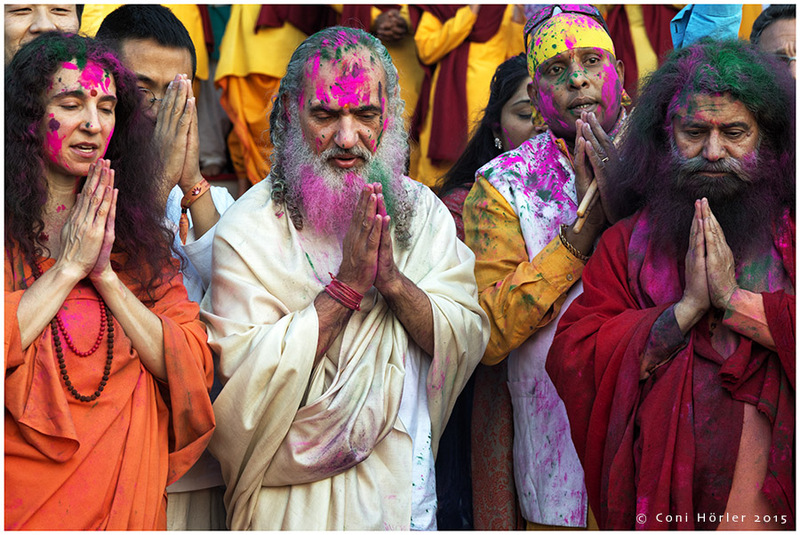 Other highlights included the Holi celebration in which the Ashram opened its gardens allowing everybody to enjoy splashing each other with eco-friendly colors. The Yoga Festival is the biggest Festival of its kind in India and it was clear that many of the participants were enjoying it, and even looking forward to coming back next year. It has the biggest names of yoga teachers and masters each year and surprises the audience with special invitees, such as Baba Ramdev. Be sure not to miss it in 2016, as it continues to expand. Anne wrote a personal blog about her experiences at the festival on her website, so feel free to read on over here: Energy and Transformation at the 16th International Yoga Festival in Rishikesh. All photos by Coni Hörler. International Yoga Festival in Rishikesh, was a huge event to promote yoga activity in the state of Uttarakhand in India, Our Prime Minister Mr. Narendra Modi’s one of the dream projects is to promote Yoga in the world and no doubt Rishikesh can play an important role in this direction.